Figure 1. Aerospace fuel injector. Figure 3. 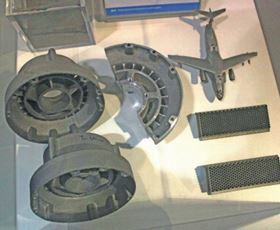 NLR additive manufacturing examples. Figure 4. Alloy 718 honeycomb structure by AM. Figure 5. All-metal AM model aeroplane with integral hinges. Figure 6. 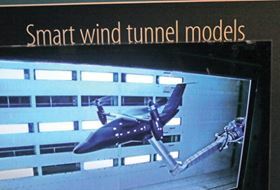 Futuristic ‘smart’ wind-tunnel model of hybrid transport. Figure 7. Redesigning for additive manufacturing can save even more than that normally lost as swarf during machining. It is common knowledge that virtually every major aircraft and aero-engine manufacturer is now deeply immersed in additive manufacturing, whether for metres-long wing ribs with little or no machining or superalloy turbine blades with intricate internal cooling passages. 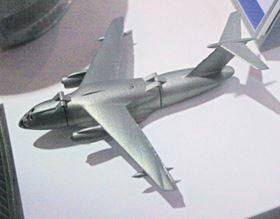 So at this year's Farnborough International Airshow we tried to find something a little different for MPR readers. The exhibition halls at Farnborough are built on a hill, with quite a climb from runway level at the bottom to the rarified air of Hall 4 at the top. There we found a cluster of organisations employing metal powders to develop AM applications. Unfortunately the FIA catalogue compilers haven't yet caught up with the technology, for there was no product classification for additive manufacturing, nor for 3D printing, and some of the exhibitors on joint stands were not listed separately. Thus we had problems referencing a few of our photos. My apologies to any unidentified organisations. Specialist company 3T RPD Ltd of Newbury, Berks, contributed two outstanding examples of the additive manufacturer's art. First of these (Figure 1) was a highly complex aerospace fuel injector, redesigned to take full advantage of PM AM. It still contains eight separate parts, but they are combined and built, already assembled, in a single operation. 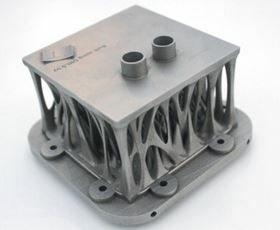 The second is a hydraulic manifold (Figure 2) made from precipitation-hardened 15-5PH stainless steel by DMLS (direct metal laser sintering). Smoothly curved tubes are built inside the lightweight block, just 40% of the weight of the previous solid design. 3T worked with BBC Research and Development and Southampton University to build for the Blue Peter TV programme what is claimed to be the world's first AM aeroplane. My next choice reminds us that Farnborough is an international show, with an additive manufacturing exhibit from the Netherlands' National Aerospace Laboratory (NLR) in Amsterdam. NLR is an independent knowledge enterprise with a multidisciplinary approach to developing new and cost effective technologies for aviation and space, from design support to production technology. It covers all the essential phases in research, from validation, verification and qualification to evaluation, contributing to the innovative and competitive strength of government and industry. Figure 3 shows part of a display of NLR efforts in AM, employing an SLM (selective laser melting) machine with working volume 30×30×30cm. Available alloys are Ti6AL4V, Al and 718. 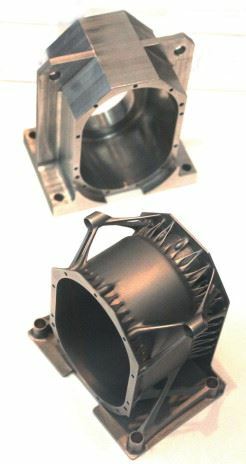 Of the two components of similar design on the left, the rearward was CNC milled from a solid block of metal, whereas the front example was ‘3D printed’ from metal powder with laser sintering. 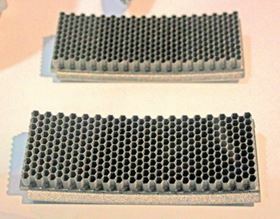 The alloy 718 honeycomb seen more clearly in Figure 4 is made with cells at 90º or 45º to the horizontal. Also shown are a shroud for a gas turbine and the all-metal AM model aeroplane demo (Figure 5). A more practical use for precision AM solid metal aircraft designs is for wind tunnel models like that shown in Figure 6, where subtle but important changes (like aerofoil profiles) can be incorporated at short notice, contrasting with traditional manufacture where new models may take weeks or months to fabricate. Finally in this brief selection, here (Figure 7) is a practical demonstration of how much material can be saved by redesigning for additive manufacturing. The clunky original, above, is the component machined ‘subtractively’ from a solid block of metal, whilst the AM version below strips the design down to essentials, saving even more weight, before manufacture is initiated. Member companies of the MPIF have been invited to a powder metallurgy (PM) industry day at Fiat Chrysler Automobiles' (FCA) North American headquarters.